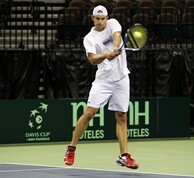 Andy Roddick has 33 career Davis Cup singles victories. Mardy Fish is ranked a career-high of No. 8. Mike Bryan in a practice session in Austin. AUSTIN, Texas – Andy Roddick first moved to Austin as a child and lived there until age 11, returning to Texas as an adult and has now lived in the city for 16 of the 28 years of his life. It is the city where he currently lives and where he had been trying to get a Davis Cup tie. This year, his wish came true and Austin was selected as the site for the U.S. vs. Spain Davis Cup Quarterfinal July 8-10 at the Frank Erwin Tennis Center. Roddick’s love for the city was reciprocated immediately by the fans, who grabbed tickets instantly, as the event sold out in a matter of minutes. And now after months of waiting, the week has arrived for Roddick, the world No. 10, to join his friends Mardy Fish, the world No. 8, and 2011 Wimbledon Doubles champions Bob and Mike Bryan on the U.S. team to play the tie under the direction of Captain Jim Courier, who is making his home debut as the U.S. captain. They will face a Rafael Nadal-less Spanish team that is still dangerous with world No. 6 David Ferrer, No. 23 Fernando Verdasco, No. 31 Feliciano Lopez and Marcel Granollers. Roddick is staying at the hotel with his teammates this week, although the team did enjoy a Fourth of July barbecue at Roddick’s house as the week began, which included a special hot dog eating contest (won by practice partner and 2011 NCAA singles champion Steve Johnson). "I was trying so hard to get a Davis Cup tie here to Texas. Then once Austin kind of fit the bill for this tie, to see the fans come out, tickets sell out, it almost validated the effort," Roddick said. "I was real happy to see the support that Austin and central Texas has been giving this event as far as selling out, as far as the excitement. It's just nice to see excitement for tennis in this area of the world." And excitement there certainly is. The official lineups for this weekend’s tie will be unveiled by Courier and Spanish Captain Albert Costa, although Courier’s lineup will be no mystery with two top ten singles players and the world No. 1 doubles team on his squad. Costa, though, has at least three options for singles with Ferrer, Verdasco and Lopez and the U.S. will have to wait and see who play Roddick and Fish Friday and Sunday as well as the doubles rubber Saturday. At Wimbledon just over a week ago, Lopez scored his first-ever victory in eight matches over Roddick, as the lefty put on a serving clinic to defeat the American in just the third round, perhaps earning his way into the singles lineup. It was a difficult loss for Roddick, but having such an important Davis Cup tie in his adopted hometown so soon afterwards, helped him regroup and refocus. "I lose at Wimbledon. It's kind of my disappointment. You know, it's my loss. These guys still went through and had great tournaments," Roddick said of the Bryans’ title win and Fish’s quarterfinal run. "Here it's a totally different atmosphere. We get to three (wins), I don't think any of us care how we get there. Davis Cup is an environment I'm extremely comfortable in. I felt like I was playing well going into Wimbledon. Played decent. Ran into a guy who was serving really well and was a hot player. It's actually probably healthy for me that I had this around the corner. It was something that I could instantly focus on after the fact." Fish, 29, is making his first Davis Cup appearance of 2010 after a great season that has seen him reach his career-high ranking. He won two singles matches and was part of the winning doubles team that clinched the U.S. team’s World Group Playoff against Colombia last September and secured the U.S.’s spot in the World Group for 2011. He is happy to be back and playing for Courier for the first time on a team that is close and works well together. "Andy is and always will be sort of the lead guy on the team. I've played well in the past 12 months. You know, these are the benefits of playing singles on the Davis Cup team and being hopefully a solid contributor on the team," he said. "I played a few over the years, my last one being in Colombia, getting us back to the World Group here. It's all sort of a team effort. Everybody's got a role." The role for the Bryans is very clear cut as arguably the greatest doubles team in history. With their 2011 Wimbledon title, they tied Todd Woodbridge and Mark Woodforde for the most career Grand Slam doubles titles with 11. In Davis Cup, they have been just as dominant, going 18-2 in doubles in their careers and 17-2 together as a team. The two also won the clinching match back in 2007 when the U.S. won its last Davis Cup title. Despite a hectic few weeks that saw them play six straight days at Wimbledon due to weather, long matches and darkness, they are feeling great. "It was a whirlwind week. We played six days in a row, which we've never done before. We played two five-setters. One was two days long, 16-14 in the fifth, our longest match," Mike Bryan said. "We're feeling pretty good actually. Coming in here really confident." The team has three collegiate stars in Johnson, Bradley Klahn and Evan King as practice partners. Klahn and King are both lefties to help the U.S. prepare for the southpaws Verdasco and Lopez. "Certainly when you look at Feliciano López and Fernando Verdasco and David Ferrer, you're talking about quality players," Courier said of Spain’s potential lineup. "Those are three extremely quality singles players that they can obviously do whatever they like with those guys as far as who plays and it will still be difficult for us. But we know that we have a job to do, which is why we're here early this week, that's why we're preparing. We're very focused on what we have to do on our side of the net, knowing there's a righty and two lefties out there for us."